The outsourcing history of India is one of phenomenal growth in a very short span of time. If Software Engineering Institute's 'Capability Maturity Model Level 5' is the highest quality certification in the software industry, then India's the place to be. With 65% of the world's CMM Level 5 companies and one of the world's largest pool of scientific and technical talent, India is a logical choice for outsourcing. What can be outsourced to India? At a glance see IT related outsourcing options to India. This list, although not extensive, will entice you with the overwhelming potential and possibilities of outsourcing. Click here and begin to explore a new way of doing business. With the advent of globalization, more and more jobs are being outsourced to India. 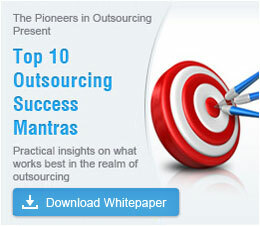 The outsourcing trend has brought with it a vast number of opportunities to India. So why are people outsourcing jobs to India? Let's find out why job outsourcing has become so popular. Outsourcing to India is now more about high quality rather than cost. Indian companies are fast scaling up to match or surpass international quality standards and are ensuring that they stay ahead through stable quality systems and continuous quality improvement. Outsourcing BPO Services to India offers benefits not only in terms of cost reduction, but also in terms of increased productivity and quality. Companies along with their customers benefit since they can access some of the best talent and expertise in the industry at lower rates. Business process outsourcing or BPO in India has evolved from its early 'sweat-shop' image to the status of a strategic differentiator in the global marketplace. BPO is the contracting of a business task to a third party service provider. Factors responsible for outsourcing success are: quality processes, scalability, integration of global markets and seamless global delivery of work across borders through the internet. Bangalore possesses much of the attraction of other cities in India for the BPO sector; talented resources, good educational institutions, a large English speaking population, and technological prowess. However, it is a proactive state government that makes constant efforts to facilitate new investments, which gives Bangalore an edge over other Indian cities. Despite few challenges, the future of rural BPO in India shows promise and shall clearly encompass viable rural areas. Bangalore has good infrastructure, with large floor space and great telecom facilities. With a huge number of IT/ITES companies, R&D and product development facilities, and call centers mushrooming the demand for commercial space has risen drastically. These companies want the best space, with high ceiling heights, good broadband connectivity and areas of around 40,000 to 50,000 square feet. Intellectual property (IP) refers to creations of the mind: inventions, literary and artistic works, symbols, names, images and designs used in commerce. IP plays an important role in an increasingly broad range of areas, ranging from the internet to healthcare to nearly all aspects of science and technology, law, literature and the arts. Are you looking at reducing your software development costs? One attractive way would be to relocate some of the development work to countries like India. While there are tremendous opportunities in these countries, a clearer understanding of the tax and legal formalities could mean the difference between smooth outsourcing of work and a confusing tangle of delays and cost overruns. Here's an article that discusses these issues in depth, without the confusing legalese. If you are considering outsourcing to India, but need some information on the legal issues in offshore outsourcing or are worried about whether your contract will be honored by the Indian Legal System, read on. What is it? How does it help you? Get to know more about job outsourcing here. Should you start your own captive office in India or outsource to an Indian vendor? Learn more! Numerous reports and studies in recent years have proved that India is the most attractive destination when it comes to outsourcing.